AMD buddy, we’ve missed you. A few years ago there was a genuine choice between laptops with Intel inside and those with AMD. Then Intel continued to update and improve its processors while AMD did not. It was a big bummer if you wanted options when picking out a laptop, and it was particularly painful for cheap laptop fans, as AMD-based laptops tend to be less costly than their Intel rivals. 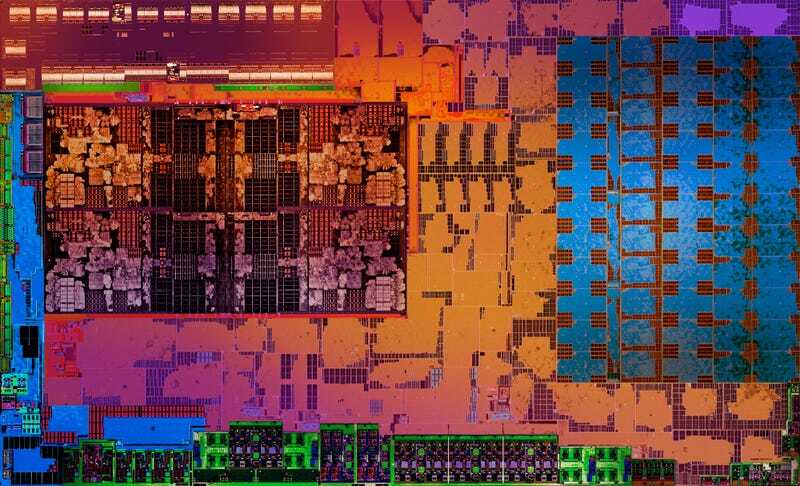 Now, finally, AMD is coming back into the mobile space and it claims it’s built the fastest processor you can fit into an ultra-thin notebook. The ultra-thin part is very important. These new chips are based on the Ryzen microarchitecture introduced earlier this year, and for now, they are limited to a single kind of processor that requires an average 15 watts of power and fits in a laptop just 14mm thick. So you likely won’t find these processors in huge gaming rigs from Razer or MSI, nor will you find them in something as crazy slim as a chromebook or a MacBook. Instead AMD will be initially launching the new Ryzen mobile processor in three notebooks: The 15.6-inch HP Envy x360, 15-inch Acer Swift 3, and the 13.3-inch Lenovo Ideapad 720s. Previous iterations of those laptops start at around $700 to $800 so one can only hope the new Ryzen-powered ones will cost about the same. And if AMD’s new claims of speed are true, these laptops will be a whole lot faster than their Intel-based competitors. That’s because AMD isn’t just incorporating the Ryzen microarchitecture, it’s using the Vega architecture from its latest batch of video cards. In other words, this is an integrated graphics solution like the one found in every Intel processor. There’s no need for a separate graphics card like you find in gaming laptops or high-end workstations. AMD claims that it’s using the unique knowledge gained from being the only laptop chipmaker that produces CPUs and GPUs to make the wicked fast chips. In Cinebench R15, a synthetic benchmark that approximates a workload for 3D rendering and editing, the new AMD Ryzen 7 2700u scored 719. The brand new Intel i7-8550U managed 498, while the seventh generation Intel i7-7500U did just 325. In 3DMark Time Spy, a synthetic benchmark that approximates the performance of a high quality DirectX 12 game, the Ryzen 7 2700u scored a respectable 915, which actually puts it on par with a discrete graphics solution like the Intel i7-7500U and Nvidia GeForce 950M combo you might see in something like the Medion D17KHN or last year’s Surface Book. That score is also twice as fast as the score that Intel CPUs with integrated graphics, like the aforementioned i7-8550U and it-7500U, measured. What all this benchmark jargon means is that the new AMD APUs (AMD’s term for CPUs with integrated graphics) could be a viable option for people looking for decent discrete graphics performance without the price and power requirements that such performance usually entails. But it should be noted that these are all AMD’s numbers, and that they were gathered in controlled settings in the AMD labs. To find out how the new Ryzen chips actually fair in the real world, they’ll need to be tested by an independent party. There will be two chips at launch: The AMD Ryzen 7 2700u, which has 4 cores and 10 CUs (think of CUs as cores for graphics processors), and the AMD Ryzen 5 2500U, which has 4 cores and 8 CUs. The chips will support 4K streaming from major content providers, including Netflix, and will also support Freesync monitors, AMD’s answer to Nvidia’s G-Sync, in case you want ultra smooth motion in your video games. AMD is also hoping that because these chips are so fast they’ll return to idle faster, which could mean better battery life than anything from Intel, or from the previous generation of AMD APUs. It might have only been a year or two, but it feels like eons since Intel had a proper competitor in the laptop space. While this is just one small step into the space, if AMD’s speed claims hold true, this could mean some real competition for Intel. And when big brands compete, it’s usually the consumer that benefits. Welcome back AMD.